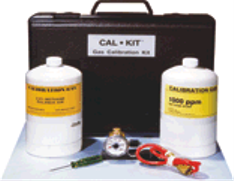 We stock a variety of calibration kits to service the instruments we offer. The gas in each kit will be different depending on the type of product. Be sure to tell us what product you need to calibrate! Calibration is important! Lives may depend on it! All gas detectors must be calibrated on a periodic basis to insure proper operation and of the product. Instruments that are not working properly could be dangerous!